Heat oil in a large saucepan over high heat. Add mince and cook for 5 minutes or until browned. Reduce heat to medium and add Leggo’s Pizza Sauce, Leggo’s Bolognese Pasta Sauce and water. Cook sauce uncovered for 5 minutes, stirring occasionally Season with salt and pepper to taste. Meanwhile, combine ricotta, parsley, egg, ½ cup of the mozzarella, and the parmesan in a bowl. Place a small amount of bolognese sauce in the base of a 5cm-deep, 20cm x 28cm lasagne dish and cover with a single layer of lasagne sheets. Top with half of the bolognese sauce, 1/3 cup mozzarella, a layer of lasagne sheets, the ricotta mixture and remaining lasagne sheets. Finish with remaining bolognese sauce and sprinkle with remaining mozzarella. 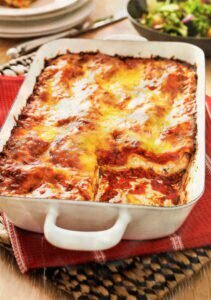 Bake lasagne in a preheated oven at 1800C for 25 to 30 minutes or until cheese is bubbling and golden. Stand for 10 minutes before serving. TASTY TIP: Pour the cup of water into the empty jar of bolognese sauce and swirl before adding to the meat to ensure you use all the sauce!